Does your baby need Evivo? Your baby's pediatrician is a helpful resource for guidance in protecting baby’s gut now for a healthy future ahead. Here are some key questions to get you started. Print this page, screenshot it on your mobile phone or device, or download and email this PDF to your doctor directly and begin this important conversation today. What's gut health and why is it important to my baby? Early in life, the right gut bacteria is critical to gut health. However, most babies born today lack the good gut bacteria B. infantis that are important for proper development of the immune system and metabolism for lifelong health. Why is this critical good bacteria missing from baby's gut? 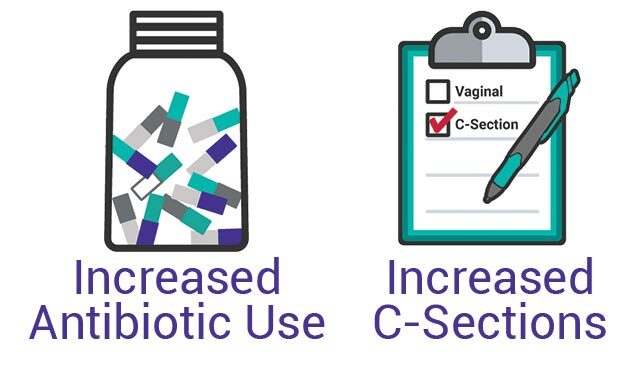 Over decades, the widespread use of antibiotics, including those linked to Group B strep, and the common practice of C-sections, led to the disappearance of the good bacteria B. infantis in baby's gut. What happens without this good bacteria? Without B. infantis, harmful gut bacteria can thrive. These bacteria are linked to higher risk of colic and autoimmune conditions like eczema, allergies, diabetes, and obesity. How can I replace the good gut bacteria and protect my baby? Evivo is the only baby probiotic clinically proven to restore key good bacteria, B. infantis, to baby’s gut and reduce bad gut bacteria by 80%, including specific strains of E. coli, Clostridium, Staphylococcus, and Streptococcus1. When should I give my baby Evivo? Evivo is critical in the first year for the proper development of baby’s immune system and metabolism. 100% good bacteria for baby. Evivo. The only baby probiotic clinically proven to restore a baby's gut microbiome to its intended natural state, reducing harmful bacteria in baby's gut by 80%. THE FIRST AND ONLY CLINICALLY PROVEN PROBIOTIC FOR BABIES. Evivo baby probiotic is the result of over a decade of research and clinical trials with University of California, Davis Medical Center. In our most recent clinical trial, babies were given Evivo once a day for a month and were compared to breastfed babies who didn’t receive any probiotic. After a month, Evivo babies had significantly higher levels of the key good bacteria, B. infantis, in their gut compared to babies who didn’t receive any Evivo. Our peer-reviewed research has been published in numerous well-respected journals, including mSphere, BMC Pediatrics, and Human Microbiome Journal. Our breakthrough findings about the baby gut microbiome and infant probiotics are covered in notable publications around the world, including The New York Times, Newsweek, Today, NPR, Nature, and Popular Science. Feed Evivo once a day, every day. Pour 1 sachet of Evivo powder into included mixing bowl. Do not use a bottle to feed Evivo to baby. Just follow the simple directions provided. Thoroughly clean bowl and syringe after each use with hot soapy water, remove syringe plunger from barrel before cleaning and allow to dry separately. Keep frozen until ready to use–will keep in refrigerator for up to 1 month. Store in freezer until ready to use. Will keep in refrigerator for up to 1 month. Please do not heat Evivo or reheat with breast milk. Evivo is a live bacteria and heat can hamper effectiveness. Ask your pediatrician for an Evivo sample or coupon today. For more information, call 800.GO.EVIVO (844.463.8486) or send us a message.